This is a three tiered acrylic easel with lips on both sides to hold plates of your choice. This display also features a 1 1/2"opening and a good amount of space between levels so that you can see more of your product. This acrylic pedestal has a rectangle base and three uprights with square tops. 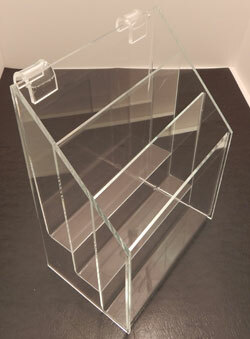 Square acrylic pedestals help you display you merchandise at different levels. Base measures 5"x 10". This 3 tier bracelet holder features 3 display bars. This unit will display nicely in your retail display case or on your display counter. It measures 11 1/2"w x 13"h.
This three tiered plate easel is 16-1/4"h, allowing viewers to see more of your product. Clear acrylic construction blends this display piece in with any decor. This acrylic shelf is great for displaying figurines, candles, mugs, etc. It features 3 tiered shelves and measures 12"w x 3 3/4"d. Clear acrylic construction is highly durable and gives a clean professional look. This three tier table display is an attractive way to display several items at once. These tables are durable, stylish and functional. Available in two sizes. This multi tier bin display is ideal for displaying hosiery, figurines, candles, etc. It features 3 or 4 bins, each measuring 12 1/2"w x 3 3/4"d. Choose from the options below,.